Sherrod Brown sat down with the editors of the Cincinnati Enquirer today. What he told them made my jaw drop. Despite the fact that the U.S. Chamber of Commerce is running ads against him, U.S. Sen. Sherrod Brown said Wednesday, he has been a strong advocate for business in his first term. “I think I’ve worked with business better than any senator in recent memory,” the Democrat said in an interview with Enquirer editors and reporters, citing his relationships with Cincinnati Children’s Hospital and the Cincinnati USA Regional Chamber. 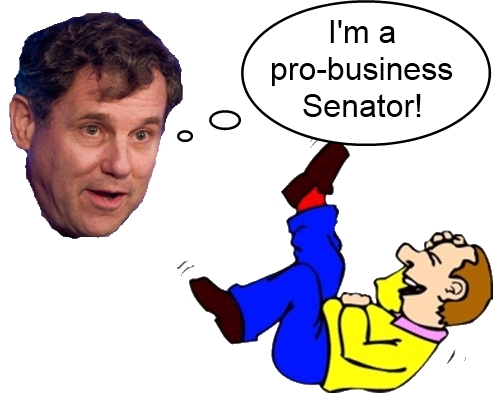 Let us count just a few ways in which Sherrod Brown has been extremely hostile to business. Brown voted for Obamacare, which contains several new taxes and regulations on businesses, substantially increasing their costs. Brown has consistently voted in line with the extreme environmental lobby, including joining the Obama War on Coal. Since Ohio gets 86% of it’s electricity from coal, this results in higher energy costs for businesses. Brown was a key proponent of “card check”, which stripped employees of the secret ballot in union organizing elections. Unions have long sought passage of card check so they could pressure and intimidate employees into voting to form a union at more companies. Unions make companies less efficient and significantly raise costs. Brown supports Occupy Wall Street, which is extremely anti-business, referring to business owners as the evil 1%. How does the U.S. Chamber of Commerce rate Sherrod Brown’s business friendliness? Based on his voting record, they give him a lifetime rating of 32, which is the 4th lowest among the current 100 Senators. If Sherrod Brown can’t distract people from looking at his record, (like a room full of newspaper editors, for instance), then he just lies about it. Usually Brown’s lies are outrageous, but this one is downright laughable.